Weekly Update 2016-05: More Australian electronic music, how to properly use hand emojis to convey the clearest message, and the amazing tennis racquet embroideries of Danielle Clough (aka @fiance_knowles). I have been watching too much tv lately. And what's worse is that I am watching before bed, which I think is making my sleep wonky. Therefore, with the sudden onset of libraries (big and small) of increasing accessibility, I have set a goal to read 15 books this year with Goodreads. I finished two books on vacation last week, and while I certainly rekindled my love of reading, it also reminded me that book reading gives me such an enriching sense of accomplishment. Especially in books such as 20,000 Leagues Under The Sea, which I am reading now, where some of the words are so complicated that they are fun to try to say out loud. I finished the book I borrowed from the little library before I left for my vacation last week, and when I return it, I was thinking of writing a little review on a post-it note in the cover. I'd certainly like to find that in a book I picked up. I appreciate the completely analog nature in which these little libraries are run, so I thought it would be fitting to install an analog reviewing system as well. And honestly, I bet this idea has already been thought of, anyway. You can check out my book-reading progress at Goodreads. I have been thinking a lot lately about the next steps in my career. I love product design to death, and I find that the things I like most about it are the problem solving and user interaction. But what's more important is what I find has been missing from my day-to-day job. I am missing the use of everything in my design skillset. I conduct a healthy amount of research and user testing, and I code like crazy. I do love the problem solving that only coding can deliver. I also work very collaboratively, which I also like. But I don't do anything with my hands. I have been feeling the void of staring at a screen or page, that I believe can be filled by physical design. Which is why I am setting a long-term goal for myself to begin dabbling in Arduinos. My roommate has a bunch, and some skill to work them, and I think it's time to try it out. More coming soon. On the short term, I am going to get a new version of my dad's business card done TONIGHT after this blog post. Next week, you will undoubtedly see it in the Accomplishments section of my blog. Same goes for the beer graphic. I will be emailing a version of the design to some vinyl cutting places tonight. For some reason, I am always thinking about the design and user experience related with emojis. Not sure why. Maybe it's because they're so small yet somehow represent an (almost) full gamut of human emotion, and are well on their way to helping us communicate without the language barrier. When I just want to emote a piece of cheese to someone, there is now a tool with which I can easily carry out my task. 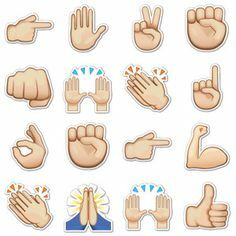 But here's what I really want to discuss: the special area of emojis that are hand gestures. Oh, those varied and wonderful hand gestures. As someone who thoroughly enjoys talking with her hands, I am a true lover of this inner section of emoji life. So we know that hand gestures are wonderful. But this is the real question. Are emojis best communicated from first hand point of view or second hand point of view? Do I want to show someone my palm as in the peace sign, or do I want to see my own view of the A-OK symbol? Faces are easy, we just look at each other's heads. But hands, those are a fully different beast. Check out more at her website here. Sew far, sew good.